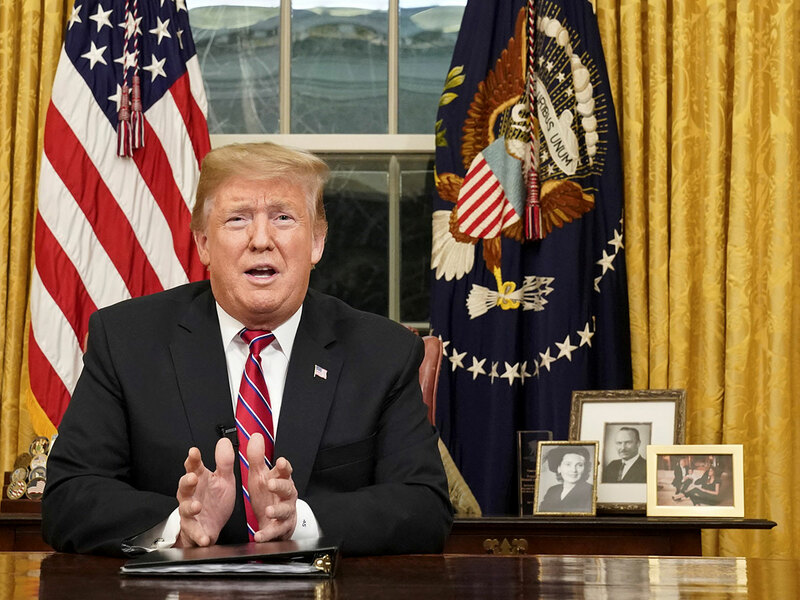 Washington: In a bid to break the shutdown stalemate, President Donald Trump on Saturday offered to extend temporary protections for young people brought to the US illegally as children and those fleeing disaster zones in exchange for his long-promised border wall. But while Trump cast the move as a "common-sense compromise", Democrats were quick to dismiss it at a "non-starter". With polls showing a majority of Americans blaming him and Republicans for the impasse, Trump said from the White House that he was there "to break the logjam and provide Congress with a path forward to end the government shutdown and solve the crisis on the southern border". Hoping to put pressure on Democrats, the White House billed the announcement as a major step forward. But Trump did not budge on his $5.7 billion (Dh20.9 billion) demand for the wall and, in essence, offered to temporarily roll-back some of his own hawkish immigration actions - actions that have been blocked by federal courts. The US government has been in shutdown mode. Senate Minority Leader Chuck Schumer also panned the proposal as "more hostage taking", saying that it was Trump who had "single-handedly" imperiled the future of the immigrants he proposed to help. The New York Democrat said there is only "one way out" of the shutdown. "Open up the government, Mr. President, and then Democrats and Republicans can have a civil discussion and come up with bipartisan solutions," he said. The offer the President announced today is a loser for the forgotten American workers who were central to his campaign promises. Trump's remarks from the Diplomatic Room marked the second time he has addressed the nation as the partial shutdown drags on. On this occasion, he sought to strike a diplomatic tone, emphasising the need to work across the aisle. He maintained a border barrier was needed to block what he describes as the flow of drugs and crime into the country - but described "steel barriers in high-priority locations" instead of "a 2,000-mile concrete structure from sea to sea". The proposal was met with immediate criticism from some conservative corners, including NumbersUSA, which seeks to reduce both legal and illegal immigration to the US. "The offer the President announced today is a loser for the forgotten American workers who were central to his campaign promises," said Roy Beck, the group's president. At the other end of the political spectrum, Trump's offer was panned by progressive groups, with Anthony Romero, the executive director of the American Civil Liberties Union, calling it a "one-sided proposal". Mulvaney said that Trump had not ruled out one day declaring a national emergency to circumvent Congress to get his wall money - as he has threatened - but added that Trump maintains that the "best way to fix this is through legislation." Trump's son-in-law and senior aide, Jared Kushner, along with Vice President Mike Pence, had led the efforts building the plan Trump announced on Saturday, according to three people familiar with White House thinking who were not authorised to speak publicly. After a heated meeting with Pelosi and Schumer that Trump stormed out of, the president directed his aides to bypass Democratic leaders and instead reach out to rank-and-file members for ideas. To ensure wall funding, Trump said he would extend temporary protections for three years for "Dreamers," young people brought to the country illegally as children. Administration officials said the protections would apply only to the approximately 700,000 people currently enrolled in the Obama-era programme shielding them from deportation, and not all those who could be eligible. The plan would offer no pathway to citizenship for those immigrants - a deal breaker for many Democrats. Trump also proposed a three-year extension to the temporary protected status the US offers to immigrants fleeing countries affected by natural disasters or violence. Officials said the exemption would apply to about 300,000 people who currently live in the US under the programme and have been here since 2011. That means people from El Salvador, Guatemala, Honduras and Haiti - countries that saw the status revoked since Trump took office - would get a reprieve. Democrats, however, criticised Trump's proposal for failing to offer a permanent solution for the immigrants in question and because he refuses back away from his demand a wall along the US-Mexico border, which the party strongly oppposes. Democrats have told Trump he must reopen government before talks can start. But during a recent trip to the US-Mexico border, Trump hinted at the possibility, saying he would consider working on the wall and DACA "simultaneously".